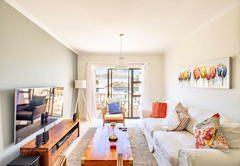 201 Alba Bougain Villas is a highly recommended property providing self catering in Century City for up to 2 guests visiting the Blaauwberg region. 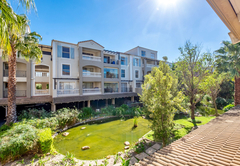 Located within a secure complex in Century City, 201 Alba - Bougain Villas offers accommodation for two guests in a comfortable holiday apartment. 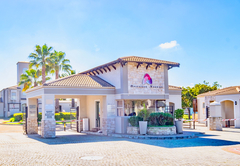 The access controlled estate has 24 hour security, beautiful gardens, playgrounds and a club house with a swimming pool and braai facilities. 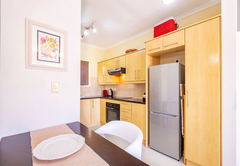 The self catering apartment has one bedroom furnished with a Queen-size bed and a full en-suite bathroom. Bed linen and towels are provided. 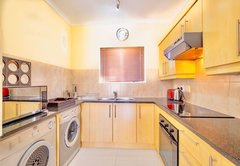 There is also ample cupboard space so you can unpack and feel at home. 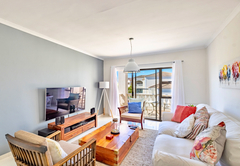 201 Alba - Bougain Villas has an open plan living area comprised of a beautifully decorated and comfortably furnished lounge which leads onto a balcony. The kitchen is fully equipped and stocked with the equipment and basic pantry items that you need. There is a small table to enjoy meals at. 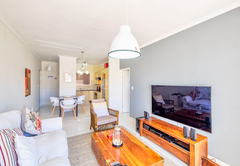 The apartment itself feels just like home - with a large couch to lounge on, fully equipped kitchen, super comfy bed, and large balcony to enjoy those balmy summer evenings. 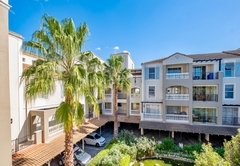 Good apartment in a great location, Service was great, al in all we had a really great holiday in Cape Town. Weather was a bit miserable some days, but glad for Cape town that it rained. 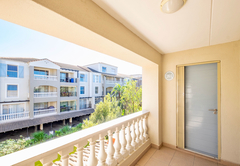 Response time201 Alba Bougain Villas typically responds to requests in 5-10 minutes.